S and I were driving down Santa Monica Boulevard in LA, Sheryl Crow’s voice bouncing around in my head. When we got to the park overlooking the Pacific, I saw the most gorgeous landscape and the saddest sight – the park was full of homeless people. It was painful. So I chose to find a way around my pain. I chose to be judgmental. “How can these people not get a job? Anyone can work at a fast food restaurant, right?” I said. Smack. There it was. 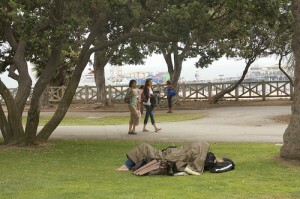 My own ignorance about homelessness. It had never occurred to me that I always had an address to put on application forms. Many of these people did not. I can’t remember what he told me his name was, but I do remember this. He was homeless and begging on the street because he had a wife and two children to feed. They had lost their house in a fire and couldn’t afford to rebuild – their homeowner’s insurance didn’t pay for some reason. He had lost his job. They were stuck. I realized there, in my idling Honda, that I was one, maybe two, disasters away from homelessness myself. It is easy for me to get callous. It was especially easy in San Francisco, the city with one of the largest homeless populations in the country, because I saw homeless people every day. It broke my heart a little every time, and so sometimes, I would just get stiff and avert my eyes, as if me not seeing made them disappear. I was cold and selfish. I was human. I did some things to help – left my leftovers on the top of trash cans so that people could eat them later, argued that the tourism board’s campaign against giving to the homeless was dehumanizing and cruel. I feel good about these things. But they are not enough. I need to do better. I need to talk to these people, to know (and remember) their names and have them know mine. I need to connect with those I so often want to ignore. I need to risk my own pain so that I can know theirs because mine, at least in this way, cannot compare. Later this morning, I am going to help put together Thanksgiving meals for people who come to our local food pantry. I am so excited to be a part of this task – my first real act as a member of the Lovingston community. But this is a small thing, and here I will not meet the people we are serving. So I must do more. I will find a way. Today, I am asking you to pray, talk, and share your stories about poverty, homelessness, and how we help. We can come together as a community – the richest and the poorest, the strongest and the weakest – recognizing that we may have our definitions of these terms all wrong. We can work together to end poverty. This, this is something I want to be a part of, and this is what I think our primary mission at God’s Whisper Farm will be. It is not an easy task. We aren’t going to throw money at this problem and suddenly find equity in our society. No, this is arduous, complex, and confusing – but it is doable. I feel it in my bones. Will you join me by sharing your stories today? By praying for my wisdom as I find a way to work here in Lovingston and in communities around the world? Will you give me your hand and work with me as we grasp hands with the poor people of our world?